If you're not texting about food with your friends at 7:30 in the morning, then I don't know what you're doing with your life. And per Sally's suggestion, NOTE TO SELF: THIS IS NOT HEALTH FOOD. IT IS 100% COMFORT FOOD. This is one of the first recipes my mom ever passed on to me, and it is THE meal that I make when I don't feel like cooking or need to make a lot of something delicious to host people or take for a meal sign up. 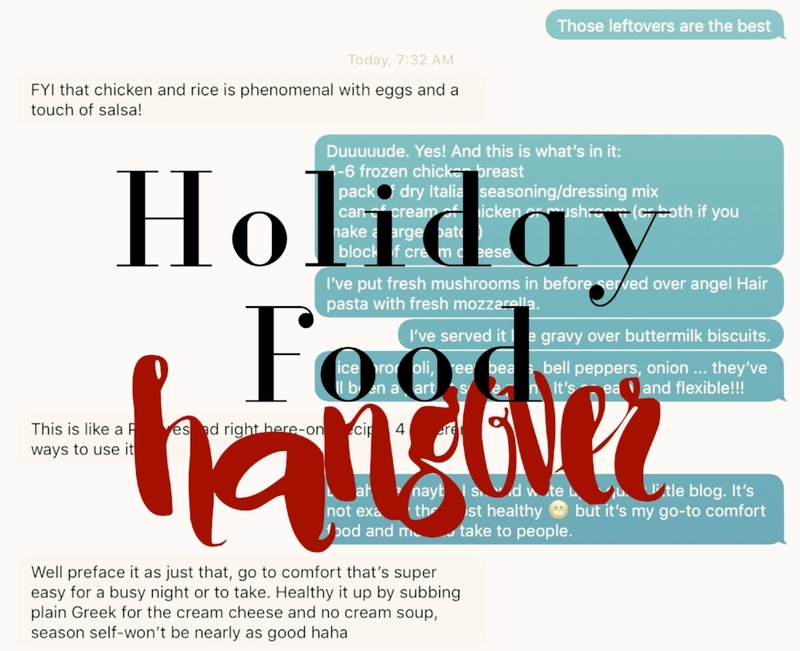 So this one is for those of you who are just totally over cooking or are done with holiday food or just straight up DONE in general! That's it. Throw all that junk in the Crockpot for 6 hours (or 4 hours if your chicken is thawed), and go on about your day. To make this recipe healthier, you can sub in items for almost every ingredient on the list. Make your own Italian dry mix if you want to avoid MSG. Use a chicken bouillon substitute if you don't want creamed soups. Use regular cream cheese or plain greek yogurt for more or less creaminess. Numerous possibilities guys, but be warned, it WILL taste different. For serving, as you can read in my text with Sally, we have eaten this over all different kinds of things; white rice, brown rice, quinoa, angel hair pasta, regular spaghetti noodles, farfalle (bow tie) pasta, buttermilk biscuits, broccolli, and italian style green beans. Frequently, in the last 30 minutes of cooking I will add in fresh diced onion, mushrooms, or bell peppers depending on what I have on hand or how I'm going to be serving. And of course, coarse ground black pepper and freshly shredded mozzarella over the top is the best garnish for pasta style serving suggestions. Sally even suggested an egg and salsa over top for breakfast. Do with it what you will, but by all means ENJOY this deliciousness. ***Do you have great recipes you'd like to share or simply enjoy blogging about food? luxe|wise copyright 2018. all rights reserved.